Ross and his associates are passionate about dogs. When reading in the press about appalling attacks on children, we feel extreme anger. Of course, only the horrific incidents make the news, but children are bitten by dogs frequently and it our job to prevent this and promote safe interaction with dogs. Some may ask, what could possibly be gained by taking dogs into a school to a group of uninterested, badly behaved children? Many believe that they are too young to understand, too old to care or too cool to show any interest. Generally, that is not the case and each and every child is all ears. 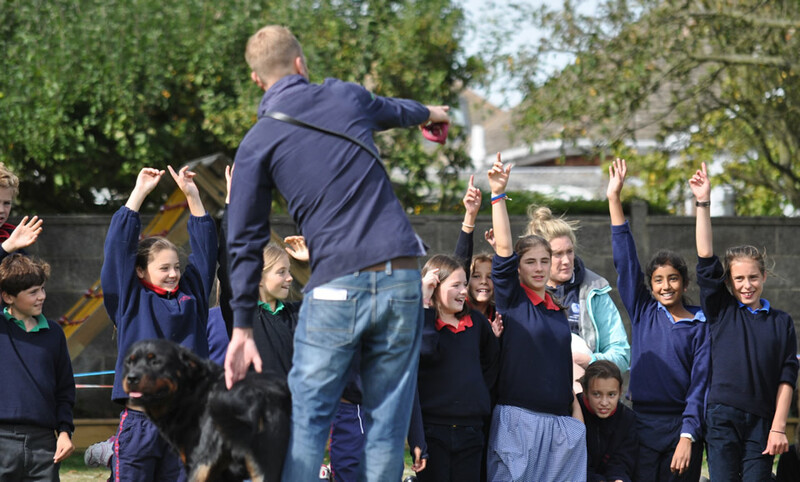 Upon our arrival – usually in convoy with a large group of dogs, the younger children are absolutely buzzing with excitement especially when they see the first sight of the dogs – luckily, as dog trainers, we seem to have an ability to control children too…the methods of training are not too dissimilar! We have what they want and if they don’t follow the rules and listen to what we say, they don’t get to engage. Safety is paramount. We make it clear from the outset, we are in charge of the day and to get the interaction they desperately want to have with the dogs – they have to do what they are asked to do in order to achieve what they want – time with the dogs. Commonly, the day starts with a talk and a question and answer session about dogs in general, who has dogs, who does not like dogs and we impart useful information for later when it is time to engage with the dogs. The children are split into small groups and we move around the playground in order they can learn all about the individual dogs that we have; how to safely approach a dog, how to get a dog to ignore you, what to do if in the park a dog runs over to you, how to engage with the family dog and all manner of safety advice. We have tools that we use to work with children who are particularly fearful of dogs and will work with those separately away from the group if required. Most however gain confidence through watching their peers engage. A little session of walking the dogs on a lead is usually a favourite before we conclude the day with a training demonstration. We have conducted these events in mainstream schools and also schools for Children and young People with additional needs. School visits have become an enjoyable part of our work. Not only is the refreshing honesty of the children a pleasure to be around, knowing that out of all of the children we meet, if we can make a difference to just one or two of those, keeping them safer or changing their attitudes or in some cases bringing a smile, then that is enough. Oh, and if we can get a few of them to lay down whilst a Rottweiler or two jumps over them, that is good fun too!